Viewers of the Funhouse TV show will know of my affection for kitsch palaces, junk shops, dollar stores, and assorted odd emporia. 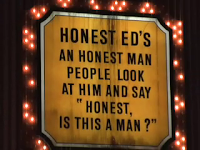 Thus upon introduction to Honest Ed's in Toronto, I felt I had to share the wonders within with viewers of the show, and now, the readers of this blog. 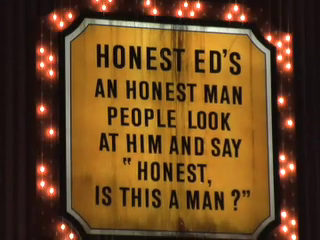 Honest Ed's does indeed sell cut-rate merchandise, odd trinkets, Canadian tourist items, and Xtian kitsch. The thing that stuns me about the place, however, is not only that it is literally a giant edifice running two city blocks (in which it is incredibly easy to get lost), but that it also serves as a sort of "Museum of Theater" (New York's Broadway and London's West End theater) covering the Sixties through the Eighties. I never felt comfortable calling him Richard. Even after we'd corresponded for a few years, even after I'd met him in person, I preferred to cheat in my e-mail salutations and start off simply with “Hi.” This, mind you, was my problem, not his. 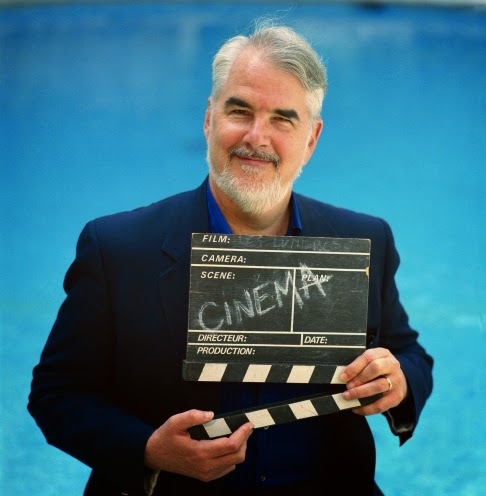 “RC,” – as he signed his e-mails, and as I came to think of him – was an uncommonly kind gent, one of the single friendliest movie experts I've ever known. He knew what he loved about cinema and pop culture in general (more on that in the second part of this piece), but he kept his mind open about the things he wasn't as fond of or had never heard of (he remained as curious at 71 as I'm sure he had been at 15). What permeated his writing, both public and private, was an enthusiasm for culture that was thoroughly infectious. He loved sharing his obsessions and if he discovered that you were already attuned to his wavelength, he reached out and said hi. Which is exactly how I first made his acquaintance. 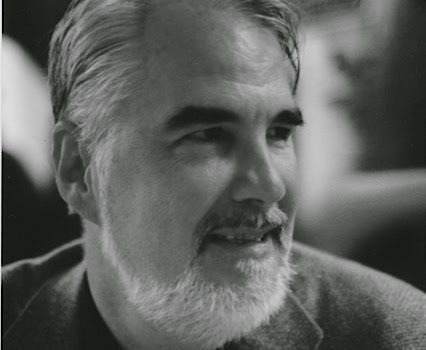 In the mid-Nineties, a publicist for a distributor of Hong Kong features told me that “Richard Corliss from Time magazine” had told her that my show Media Funhouse was covering HK cinema – many of us were utterly obsessed by it in that period – and I should be put on her list. A few years later, in 2000, I received a phone call from Time office asking if I could supply images from my show to accompany a piece Corliss had written about it. I was delighted to read the review, since he had focused on the range of material I covered (from “high” to “low”), and he found time to convey the joys of the mighty Nelson de la Rosa. I wrote to him to thank him and ask if I could take him out to lunch (this review having been a major boon for the show, both then and now). He said he had a policy of not meeting the people he wrote about – a policy he later thankfully broke – but what happened after that was that we became e-mail correspondents. I will be eternally grateful for RC's continual plugging of the show and this blog in his writings, but (and I really do mean this), I was even happier about our e-mail exchanges. The fact that he would supply me with more info about something I'd covered on the show, correct me on a small point, or just make a connection between that item and something else in popular culture, was a delight. Being a research junkie myself, I could sense in his writing how much he loved to “connect the dots” between cultural phenomena, as well as just being able to rhapsodize about something he clearly loved but was probably not going to be able to write about for Time (as the years went by, he continued to be one of the magazine's major film critics, but unfortunately wrote less and less about his other cultural passions). Some of the pieces of the puzzle came together for me when I read in Richard T. Jameson's tribute to him that RC was plagued by insomnia (most likely the way he found the Funhouse). Our informational and fanboy e-mails usually had very extreme time stamps – I wrote to him very late at night and then received replies that were written in the very early morning hours. E-mail may have none of the personal touch of the handwritten letters of yore, but there is something more personal and intimate about the notes written at the beginning and end of the day. 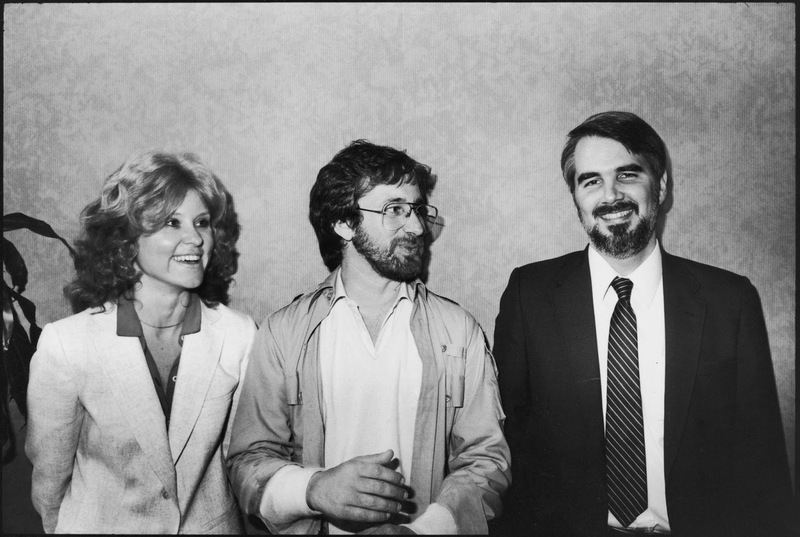 RC with some director-mogul type. Thus, I don't have the bulk of our correspondence with him, but am left with the memories of what we gabbed about to each other in print: I shared certain pieces of “news” (usually deaths or appearances of local cartoon exhibits) and he passed on obits as well, while also sending other bits of news. He told me in person that the only Funhouse episodes he wound up fast-forwarding through were my Jerry Lewis tributes (but he did note that I knew my subject well), but he was very good about sending me weird articles about Jerry that he had come across. He also would reflect on a topic I tossed to him, and supply anecdotes, odd trivia, and, occasionally, his own memories of having encountered the item for the first time. 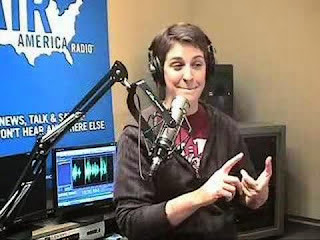 We shared a fascination for the well-intentioned but poorly run Air American Radio. Corliss championed Rachel Maddow from the beginning (it was obvious to all who listened that Al Franken didn't care about what he was doing, Janeane Garofalo was a walking timebomb of crazed emotion, and Randi Rhodes was extremely knowledgeable but also a very hard listen). He was very happy when she wound up being the only person to emerge as a “star” from the AAR fiasco. His overjoyed piece on her new primetime show is here. To my knowledge Rachel hasn't acknowledged the passing of one of her earliest champions in the press, although she was so pleased by his initial write-up that he and his lovely wife Mary attended a party thrown by Rachel and her partner in the West Village. Richard was thus a valuable cheerleader, and he was great at conveying his unbridled enthusiasm. 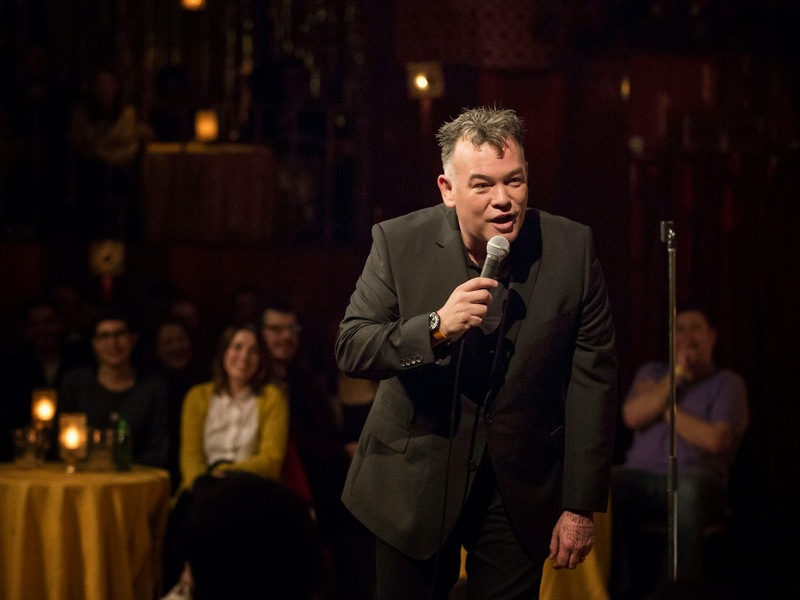 Around 2009, I became utterly obsessed with the work of an amazing crop of British humorists (standups, actor/writers, TV producers) and began to show their work a LOT on the Funhouse TV show. I had a feeling I might be driving away some of my regular viewers who were more attuned to my presentations of European filmmakers and vintage American film and TV. 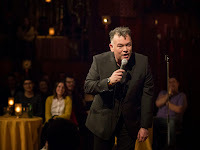 Richard tapped into my enthusiasm and wrote, thanking me for my on-air “101s” about the work of Stewart Lee and Armando Iannucci, among others (those were the two whose work he particularly cottoned to). He passed on notes about his fascination with Jerry Springer: the Opera, the controversial musical cowritten by Lee that was decried as sacrilegious and has been rarely staged in the U.S. (He had seen it in London.) He encouraged me to dig even deeper into this well of recent British comedy by, again, supplying anecdotes, compliments, and info, in a discursive, wonderful-to-read fashion. I finally met Richard in late 2011 when he and Mary invited me to a gathering they had celebrating a book published by the brilliant film historian David Thomson. 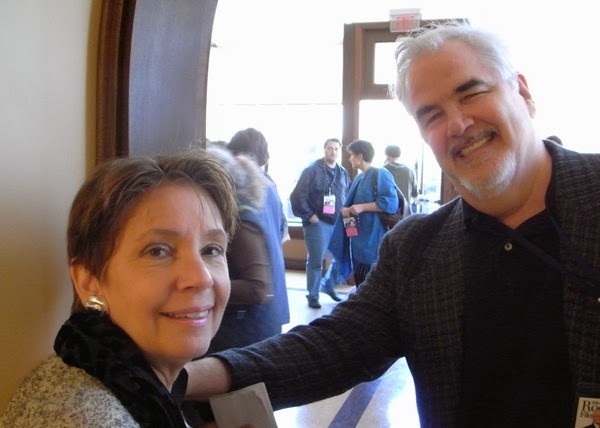 He was exactly as amiable, generous, and friendly in person as he had been in e-mail (Mary is a delight as well). I inquired about his movie collection and was shown walls of beautifully crafted shelves (on wheels so as to “disappear” into the wall) containing DVDs and probably a few thousand VHS tapes. We spoke about our former infatuation with HK cinema (which petered out for most of us in the late 1990s after Hong Kong became a “special administrative region” – read: colony – of mainland China). 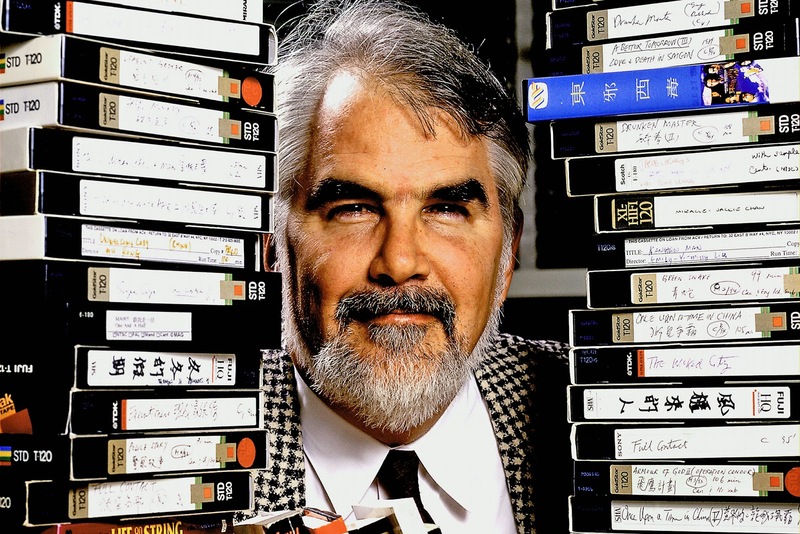 He also showed me a shelf of tapes that contained episodes of the Funhouse (my work was shelved below his Disney VHS collection – he loved animation deeply – and above “miscellaneous auteurs”). The last time I contacted him, the wellspring of his generosity flowed again. I had begun to write a piece on the comic novelist Max Shulman – something Richard and I had talked about back in late 2013 (the finished piece appears below). He had started research for a piece on Shulman that I believe would've dovetailed with the release of the complete Many Loves of Dobie Gillis DVD box set. In the meantime he attached his “raw notes” for the piece that he never wrote. I wound up not making use of them in my writing – the quotes from his e-mails offering a capsule “summing-up” of Shulman were more valuable, so I went with those, citing him as the source for the quotes. The very act of him sending his notes on again defined him for me – *no* writer sends another writer his/her notes unless they are close friends, or the one who has done the research has been assured that he/she will get a nice credit on the finished piece (or cash in hand). The fact that he sent them on to help me write the piece was an offhanded gesture that I don't think he thought about in much depth, but, again, demonstrated his selflessness and generosity. He thought it might be fun to see me pay tribute to Shulman, and so he sent on the fruit of his labor to make that happen. Believe me when I say that doesn't happen a lot in the world of film reviewing. Corliss the writer wasn't just a great wordsmith, he was an excellent (and quite dedicated) researcher. His obits for celebrities dealt with their public image, but he always delighted in illuminating the more obscure corners of their careers and connecting the dots between their work and that of their contemporaries (or successors). Because of his own expertise in the craft of paying tribute to “the passing parade” and his very sudden passing, I find it very difficult to write anything like a linear Deceased Artiste tribute for him – thus this lopsided collection of very fond memories. It's a helluva lot easier to say goodbye to someone you never knew in person. Richard overcame that obstacle beautifully in his heartfelt tributes to his friends Andrew Sarris and Roger Ebert, and his critical hero, Manny Farber. I was always impressed by his obits, so when confronted by the dilemma of how to pay tribute to him, I was brought back to his sunny (the word he used to describe Max Shulman) summations of the lives and careers of his fellow critics. 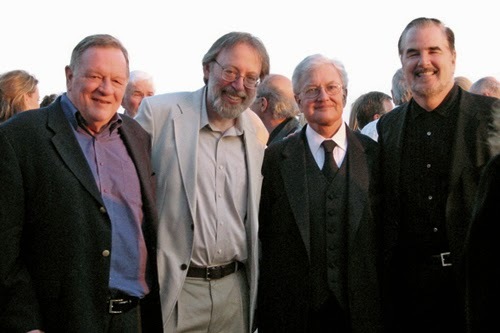 Of the three, Ebert was the most famous and yet the least significant writer (my opinion, not that of Corliss). 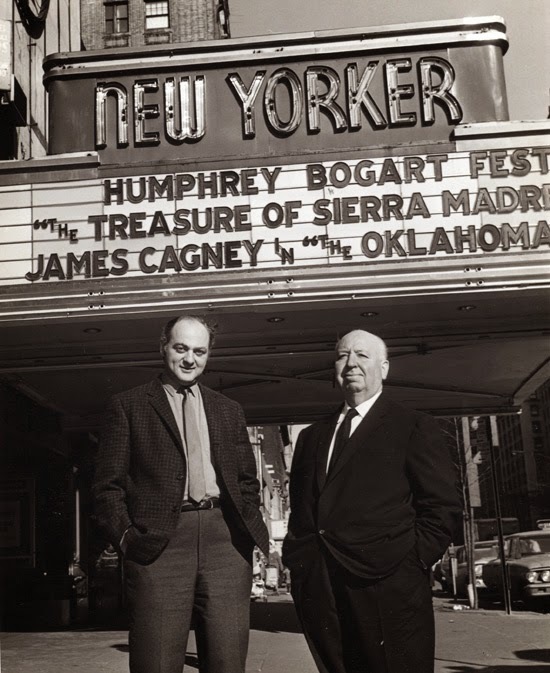 The two remained friends for decades, even though Richard had earlier written an extremely eloquent piece lamenting the dumbing-down of film criticism, which he partially attributed to the Siskel & Ebert method of rating movies as if they were Roman emperors passing judgment on gladiators. 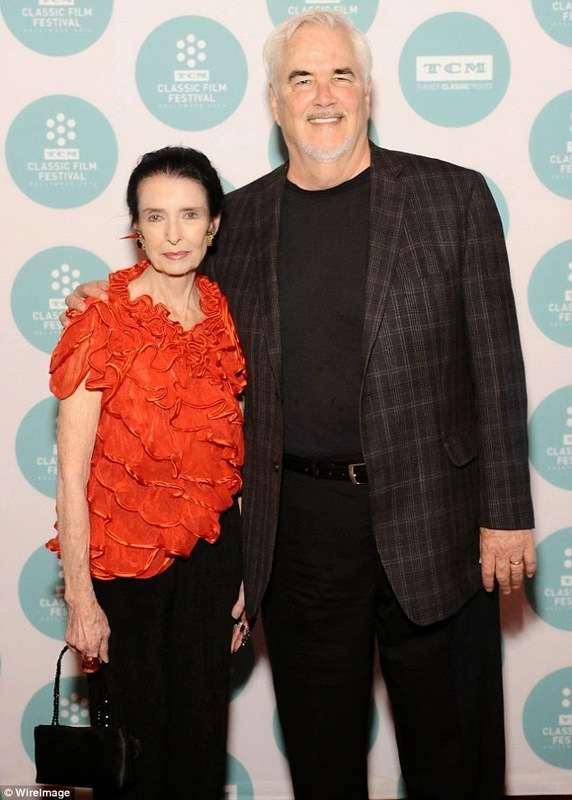 (I already expressed my opinion about the twinkle-twins of Film Crit Lite here). An image out of a Jerzy Kosinski novel to be sure (Jerzy used to go there to scope out the action as an observer), but quite wholesome compared to the story Russ Meyer delighted in telling, wherein Ebert was sitting poolside and flapping his feet like like a seal as a comely lass went down on him (that image will not leave my head – Russ, we didn't need to know that....). The third and final Corliss obit I will spotlight here is one he wrote for a figure who seemed to truly daunt him, Manny Farber. Farber is well-regarded by film critics and students, but is unknown to most moviegoers (unless they go “deep” into the well of brilliant writing about film). That piece by Corliss ends up being about his admiration for Farber's work, his admiration for Farber himself, and, ultimately, Richard's own love of research. The most interesting thing about this obit, and the reason I'm closing out on it, is because Farber's death caused Richard to reflect on who really were, in his estimation, the best writers on film (or as he phrased it, the critics whose work “makes me jealous”). He offers a list (not a “listicle,” mind you) in the piece that I will reproduce, since it does seem like he had a solid grasp on the cream of the crop. 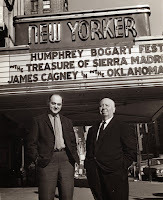 They were (in what appears to be chronological order) Otis Ferguson, James Agee, Robert Warshow, Andrew Sarris, Pauline Kael, Richard T. Jameson, J. Hoberman (whom he cited as a Farber disciple), Ed Gonzalez (one of the “new guys”), and David Thomson. But that digression into creating a Sarris-ian “pantheon” of film critics isn't all. 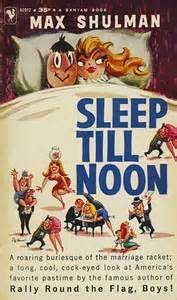 Richard also recounts his attempts to discover which reviews Farber had written for Time when he was the main film critic for the magazine for a mere five months from 1949 to 1950. The reviews had no bylines, but he discovered that they contained identification in the copies kept in the Time offices. He thus was very excited to find “undiscovered” writings of Farber's (which, he noted to me in an e-mail, he was disappointed to see didn't make it into the book collecting his work). He provides a number of film titles and then instructs the interested reader to check them out, if they happen to have a time.com subscription. He had noted to me that he had one, since the Time search engine is impossible to navigate as a non-paying “outsider” – as is easily demonstrated by putting Richard's own name into it and finding generic links to older issues of the mag and not a full list of his many, many reviews and articles available for free. What is interesting is that, even in a “summation” of an artist's career, Richard was able to turn the assignment into one of discovery. Therefore the only way I could think of to truly honor Richard's memory was to publicly spotlight how much of his art was bound up in his love of research (not just the viewing, but the reading, the consulting of books, the scouring of the Net). He was a master at it, it was part and parcel of his enthusiasm for cinema. I want to further discuss his writing in the weeks to come, but for now I will simply say that he won't be forgotten. The Funhouse will always be dedicated in a very strong sense to his memory. My in-depth discussion of Corliss's most important book, Talking Pictures, can be found here.